The NSC says people often miss work because of muscle problems. Tight muscles that haven’t been warmed up and stretched can be easily pulled or strained when lifting heavy loads. The right technique is also important to avoiding injury. When lifting, you should bend at the knees and use your legs to help you stand back up. In addition to using general caution, special equipment can also be used to prevent strain and stress on the body. Special harnesses worn by movers are often used to help distribute the weight of large loads, such as carrying furniture or large appliances. This is especially helpful for when the load needs to be maneuvered in small hallways and across stairways. 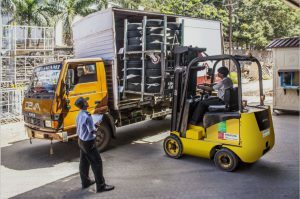 However, when there is the option, it is best to let forklifts and other lifting machines to carry excessively heavy loads. Forklifts, pallet jacks, and banding machines have working parts that can pin the body and crush bones when one is not careful. Using steel toe boots, gloves, and bright clothing can make sure you are always visible and to protect your feet and hands. When working in tight quarters, it can be hard to see everyone amid the rows of shelving, boxes, and machinery, so bright clothing is helpful. Maintaining proper machine clearance, like keeping your fingers away from conveyor belts and rollers, is essential to preventing accidents as well. Keep the workplace uncluttered, use verbal cues to signal lifting and setting down of loads, and ensure that all machinery is handled and worked around with proper caution. Working in shipping and receiving can be tight. Sometimes, people have to reach above your head to get objects. Hardhats can prevent serious problems, but rearranging equipment so the heaviest items are on the bottom is best. When your warehouse has many parts, tools, or small but heavy items, then using heavy duty storage cabinets can keep these items contained. Leaving them in boxes on open shelves can allow them to be easily knocked over, and placing heavy items above eyelevel makes it difficult and dangerous to maneuver them down again as needed. The NSC says a quarter of all injuries in the workplace are falls. While ladders were designed to make reaching high places safer and easier, they can be dangerous when placed on unstable or uneven ground. It is important that the legs of a ladder are splayed all the way so that the bracing bar in the middle can be set in order to achieve proper stability, as well. This is another instance where heavy objects stored up high can be hazardous, as handling them on a ladder can upset your center of balance. Always ensure that you have a spotter present when using a ladder in the warehouse. Falls from ground level can also be hazardous. Water, oil, and fuel spills should get immediate attention, and any wet area needs a wet floor sign to alert others to the hazard. The Bureau of Labor Statistics says warehouse workers were off from work an average of two days in 2017 because of injury and illness. Safe work practices like keeping a clean work zone and using safety equipment are two ways to prevent bodily harm. Securing ladders and watching limbs near moving parts will also provide safety at work. While other safety equipment and measures should be used in warehouse settings, these are the bare minimums to prevent accident and injury in warehouse work.